Figure 1. Get First Day of Previous Month in Excel. 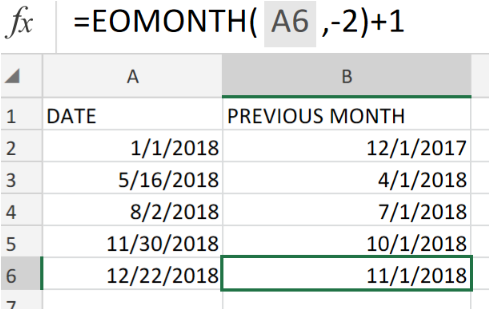 If we are required to get the first day of a previous month in Excel, we are going to utilize the EOMONTH function. The EOMONTH function operates by calculating the amount of days and months that it must roll back before determining the first day of the previous month. How to use the Excel EOMONTH function. The EOMONTH function operates by calculating the amount of days and months that it must roll back before determining the first day of the previous month. It starts by rolling back 2 months, then proceeds to add 1 day to that particular date which gives us the first day occurring in the previous month. Arrange the dates we are going to check out in a labeled column of our worksheet. Be sure to make provision for the empty cells where Excel will return our results. Figure 2. 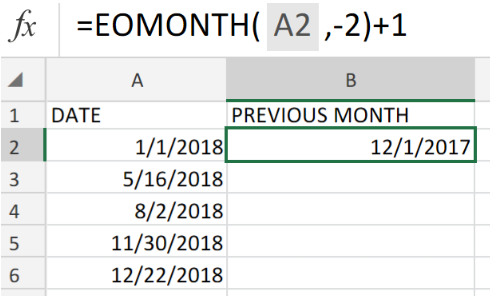 Get The First Day of Previous Month in Excel. Figure 3. Get The First Day of Previous Month in Excel. Excel returned the first date result as 12/1/2017. 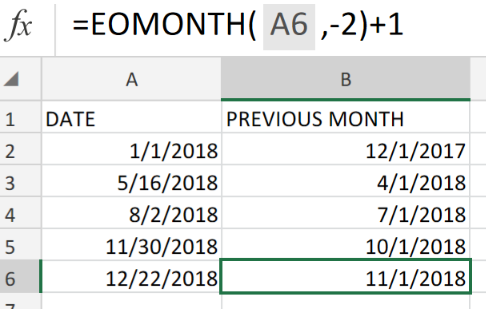 In order to get the other dates, copy a modified version of the EOMONTH formula in cell B2 then enter into the other cells in the PREVIOUS MONTH column. Figure 4. Get The First Day of Previous Month in Excel. 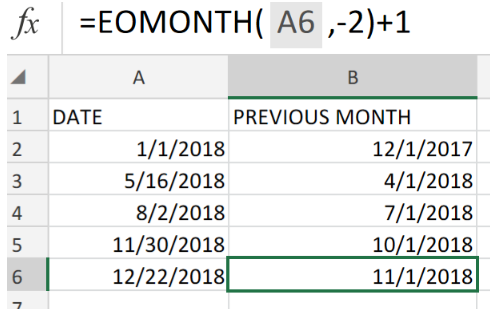 The last day of a month based on a given date can be determined by the Excel EOMONTH function. We can calculate the first day of the previous month from any given date traveling back 2 months, then adding one day. I would like to make an Excel Spreadsheet that compares present expenses to the previous expenses by year, month, and day. 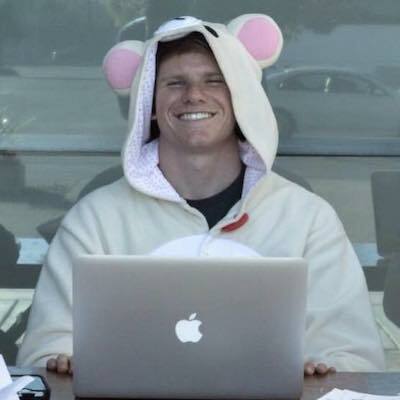 How would I achieve this goal? every month I get a very large list of recalls. and most of the time it is the same vin numbers from the previous month. 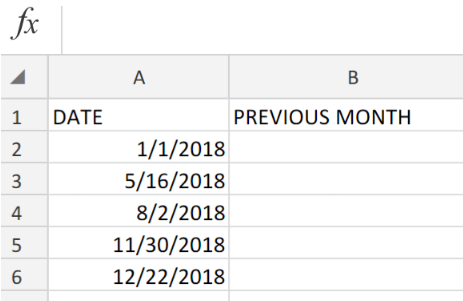 is there any way I can have the previous month selected and if there is a duplicate of the vin then to copy it onto my new month sheet?